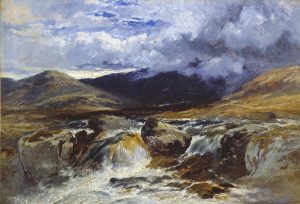 William J. M. was a renowned English landscape and fine art figure painter. William James Muller was born in the year 1812 at Bristol, UK as the son of a curator named J. S. Muller. His father was his initial inspiration, from whom he acquired a natural interest in natural history and botanical subjects. His family wanted him to become an engineer, but soon his artistic talent manifested and he received his first-hand instructions in sketching and painting. William studied the art of painting under the artistic guidance of James Baker Pyne. Muller drew several pictures of the scenic beauty of the places like Wales and Gloucestershire. He was much inspired by famous landscape painters of those times. In the year 1833, William held his first exhibition at the prestigious Royal Academy showcasing paintings that depicted landscape paintings and the ‘Destruction of the old London Bridge’. For the next year, he conducted a detailed tour of countries like France, Switzerland, Italy, and countries in the Middle East. Studying nature was his passion and work. Both complemented each other. His natural curiosity and interest in scenic landscapes has been depicted wonderfully through his sketches and paintings. He loved to visit places like Cairo, Athens, Alexandria, and the Nile to draw the ruins, river valleys, and picturesque landscapes. Later, William settled himself in London City. The city gave him the golden opportunity to organise regular exhibitions depicting Egyptian markets and street-life. In 1843 he visited Turkey after an invitation by the archaeologist called Charles Fellows. He spent almost 3 months in Lycia, Turkey making sketches about the local people and the beautiful landscapes. On his return to the United Kingdom, James spent the rest of his artistic life creating and working on various sketches, oil paintings, and watercolours of the Lycian people. His visit to France in the year 1840 was put to good use with a series of meaningful sketches on Renaissance architecture. More than 20 sketches were lithographed and duly published after a year. It is recorded in a folio called “The Age of Francis I of France”. The famous painter James William Muller died in the city of Bristol on the 8th of September 1845. According to historical reports, he died from heart disease. After his death, his work became more valuable and popular. There was a good demand by art dealers for his oil pictures (unfinished ones too) and sketches made in Lycia. These dealers then sold his commendable works and reaped rich profit margins. Many people tried to duplicate his work and created fake sketches. In 1875 Nathaniel Neal Solly made a biography on the work and life of Muller. The great painter is buried in Brunswick Cemetery located in Bristol, England. His grave is neither fancy nor lavish, it is simple with just a black polished slab stone with the inscription that reads “Sacred to the memory of James Muller, who died on September 8th in 1845 when he was 35 years of age”. There was some confusion regarding his age, as the inscription age is different from the burial records (33). The present-day tomb may be relatively new, as the grave was originally unmarked during a survey that was taken in the year 1970. The famed painter of the 19th century was commemorated with a bust that sits at the gate or entrance of the Cloister in the Bristol Cathedral. 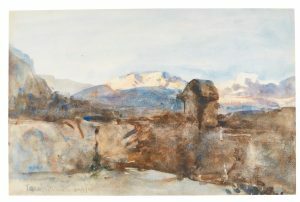 Even the British Museum holds the rich work collection of the painter’s sketches, as a legacy or gift from John Henderson. Many writers have penned biographies on the painter’s life such as Bunt in the year 1948 and Stoddard in the year 1991 to name a few.